These are additional Banerji Protocols which have been put together from the author's experience at the Banerji Clinic in Kolkata over the years. 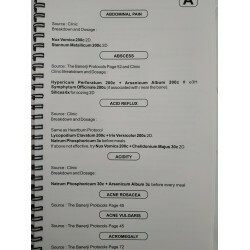 These clinic protocols are not listed in the original Banerji Protocols book. The book is in alphabetical order and references the Protocols listed in original Banerji Protocols book. To be used alongside The Banerji Protocols book.Please see sample page. Security policy - If you wish to view prices and order, please SIGN IN. Please select the currency from the Top menu. We do not store any credit/debit card information. Delivery policy - We aim to ship orders of single remedies within 24 hours of receiving a confirmed paid order. On Full Sets we aim to ship within 3-4 days of receiving a confirmed paid order. Return policy - Once order has been shipped we do not accept returns. In the event there is damage due to the Postal/Courier service we will send out a replacement at our expense.